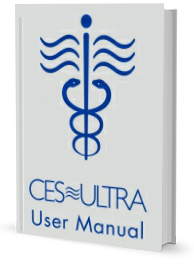 Use of Cranial Electrotherapy Stimulation (CES Ultra) to treat Insomnia, Anxiety and Depression | Neuro-Fitness. I am using [the CES Ultra] most nights for an hour or so ... It has worked well for me and usually gives me about 6-7 hours of solid sleep... One thing I have noticed is that my mind is a bit sharper, which is such a blessing at 81 years old! There is no hard and fast rule as to how often or when to use the CES Ultra. For best results though, we recommend that for the first month you use it 45 minutes twice daily, once in the morning and then again late afternoon or early evening, at least several hours before bedtime. However, you can use CES as much or as frequently as you like. Some addiction treatment clinics use it on patients 24 hours a day, and some patients want to self-treat for many hours at a stretch. CES is not addictive, and when the symptoms subside, patients often stop using CES on their own volition. Many people benefit from using the CES during stressor moments that can occur unexpectedly in the course of a day - those times when you "lose it." Using the unit in those situations - even for as little as ten minutes - can help curb anxiety. In addition to activating actual bio-electrical changes, it can serve as a reminder that you can be with yourself in a different way - a positive affirmation that you have the power to change your emotional state and are willing to create the time and the space to do so. Ultimately, each person finds for him/herself how best to incorporate CES into one's daily routine. Increasing or decreasing the amplitude does not affect how efficient the treatment is for you. Research shows that CES operates effectively at both lower and higher levels of stimulation, even at a level so low that you can't feel a thing. A common approach is to turn the amplitude to the point of sensation, turn it down slightly below that point, and leave it there for the remainder of the session. Your own comfort level always dictates the amplitude. In order to gain the most benefit the CES should be treated as more than an aside - as one more task, squeezed in between others. It is an important reminder of the need for inner quiet. Though you need not interrupt your usual activity for CES, its results are generally enhanced by setting aside a special time for its use alone. That being said, what's ultimately most important is that you regularly use it. The compact size and ear clip electrodes makes it easy to use just about anywhere and under a variety of circumstances. You can use it at home while watching TV, doing the dishes, walking, studying, at the office while poring over a report, etc. Once symptoms are reduced or eliminated entirely, the frequency of treatment may be reduced to two or three times weekly. Individuals undergoing psychiatric treatment or suffering from severe anxiety and extremes of compulsive behavior often benefit from more frequent and prolonged application. When symptoms of depression or anxiety have lessened or disappeared, it is important to have continuous access to the unit as a tool for relapse prevention on an as-needed basis. It is helpful that you work closely with your physician/licensed healthcare provider to determine the role CES plays in your overall treatment program.